Pupils attending an Open Day at the VGTU were introduced to a unique experiment conducted by the City of Vilnius and the university. On 22 March, a traditional Open Day was held at the Vilnius Gediminas Technical University (VGTU). This year, almost 500 pupils interested in the study programmes offered by the VGTU participated in the event. During the event, the attending pupils were introduced to a unique experiment conducted by the City of Vilnius and the VGTU. The ROCK project stand attracted the most curious participants who had a chance to measure their emotions (happy, sad, astonished, scared, neutral), excitement and its intensity, affectation (interest, bafflement) as well as their physiological condition (heart rate (pulse), respiratory rate). The resulting values were shown in real time online and reflected through a range of various colours by three lamps standing nearby. “During this nice event, one could see a rainbow of emotions on the faces of potential VGTU students who revealed their emotions, excitement and physiological state. 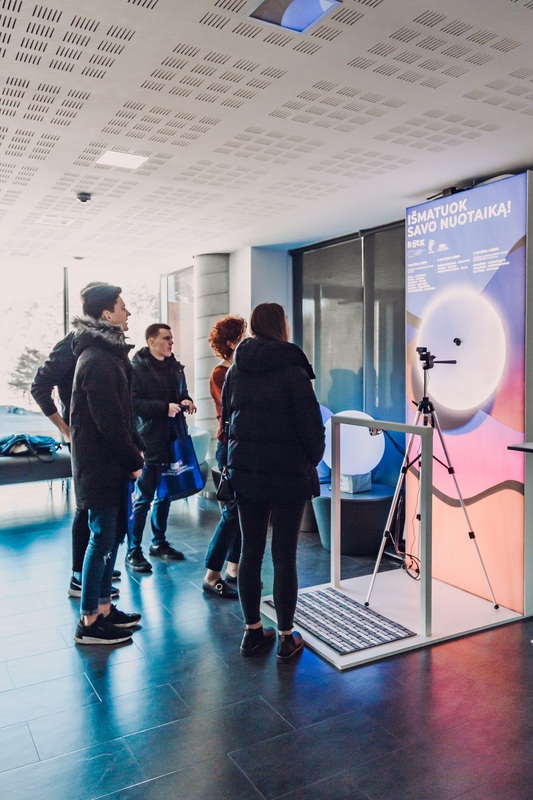 I was delighted to see that young people were curious, gathered at the ROCK stand, measured their emotions and had numerous questions,” VGTU professor Artūras Kaklauskas noted. The lamps featured seven altering colours denoting specific emotion or physiological state of a person: green meant happy, blue – sand, yellow – scared or confused, purple – excited or interested, orange – disgusted or bored, sky-blue – sad, and red – angry. Surveys under the ROCK project, which have been conducted for the second year in a row, have revealed that Vilnius city dwellers have strong and contradictory feelings at a time, that intensification of positive feelings and suppression of negative feelings are recorded in public spaces during events organised in the city centre, and that green zones fostered in the city have a positive impact on human health, happiness and productivity. The ROCK stand was earlier demonstrated at the first Vilnius Light Festival on 25 January, when the birthday of the capital was celebrated. The stand was set up at the entry to the Bernardine Gardens. Colours on the monument of the Three Crosses were changing every three seconds and reflected the strongest emotions, states and the expression of happiness of bypassers, recorded by sensors installed in different points of the capital city. Visitors of the festival elected the stand among the ten most popular entertainments of the event.